It is not everyday that you see an app getting sold out. How can an app get sold out, it is not hardware that you run out of. 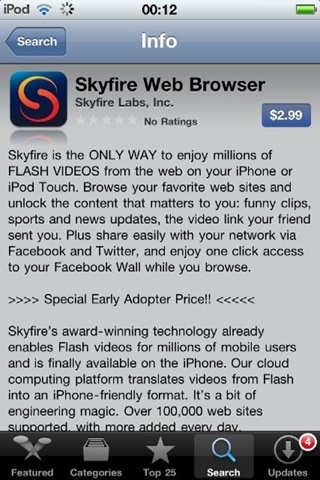 But that’s exactly what happened with Skyfire that launched its Flash-capable web browser for the iPhone last night. Priced at $2.99, Skyfire shot to one of the top grossing apps on the Store within hours and crippled the company’s servers. So within five hours, Skyfire had to stop selling the app. But again, how can an app get sold out? Well, that’s very much possible in the case of Skyfire. Web browsers like Skyfire and Opera Mini work by doing all the heavy lifting on its remote servers and renders a compressed, mobile friendly page to the phone. Considering that Skyfire’s serves also have to process flash videos and convert them into a format that can play on the iPhone. And it seems that Skyfire’s servers were not ready to face the sudden onslaught of Flash-deprived iPhone users. Were you able to download Skyfire last night? If you were, let us know what you think about the app in the comments section.